A guide to how standard and custom data attributes work in Intercom. Standard data attributes (a default set of data we already have about your users). Custom data attributes (data you send us about your users). Note: You can also use custom user attributes as qualification data. Events (data that records specific actions users take in your app). Below, we’ll explain how these data types work and how you can make the most of them. Phone number (lead's phone number). City and country (calculated by the user’s IP address location). Tag (a group a person belongs to, based on a tag you’ve manually applied to them). Pro tip: Just hover your mouse over any standard user attribute in the user list to see its full definition. Important: If you've installed Intercom on your mobile app, you'll also see standard user attributes like: 'Last seen on iOS/Android', 'iOS/Android sessions' and 'iOS/Android device', etc. Who signed up in the last week? Who signed up once but never returned? What users on the free plan are yet to upgrade? How many users have more than 1000 Twitter followers? Who was using regularly up until a month ago, and then quit? Note: Standard data attributes automatically get updated. For example if a new user signs up, or logs in today that will get updated automatically in the list. Intercom lets you send custom attributes about your users and these will all show in your user list too. Custom data attributes are information you send us about your users, like how many times they've purchased an item from your store, how many projects they have, or what plan they're on. For example, if you have a music sharing app, you could send us over the number of songs a user has played, or how many followers they have. You can send us over whatever attributes you want to better understand your customers, and it will all show in Intercom. You’ll find lots more examples here. You can create custom attributes about your users and/or about the companies they belong to. You can apply filters based on custom data attributes, the same way you would with standard data attributes. Once you’ve applied your filters, you can send these users targeted auto messages and visitor auto messages. Note: Intercom allows string-based operators for strings, numerical operators for numerical values, and simple true/false filters for booleans values. Qualification data is a special set of attributes you can update in your customer profiles as you qualify them. 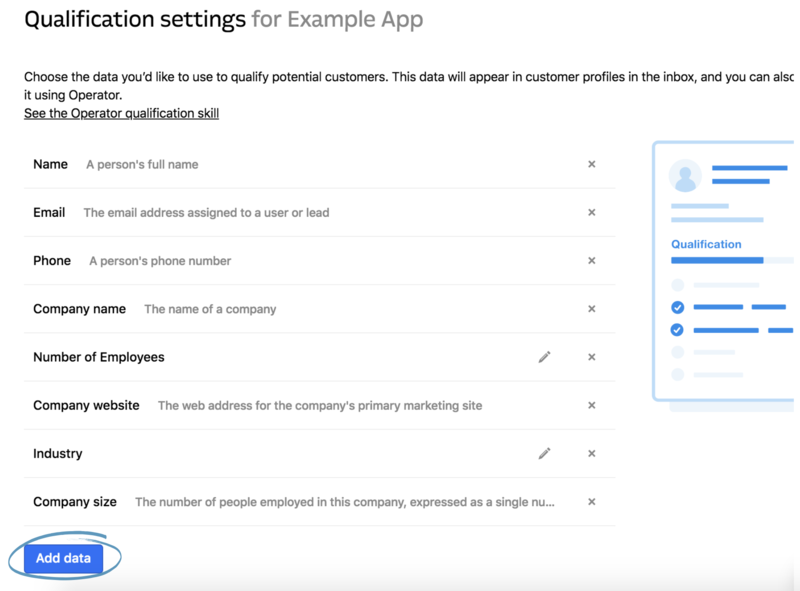 You can choose from existing custom data (both user and company data) you’ve already set up in Intercom, or you can create your own qualification attributes. Once you've set this up, you can get our bot, Operator to automatically qualify your leads for you, and your teammates can manually add qualification data to your lead and customer profile as they qualify them. Note: If you want to track this data via a ping, you need to add the key/value pairs to your intercomSettings code snippet, just as you would with other custom data. Ready to get going with custom user attributes? You can learn how to send custom attributes to Intercom, create descriptions for them, archive them and more here. 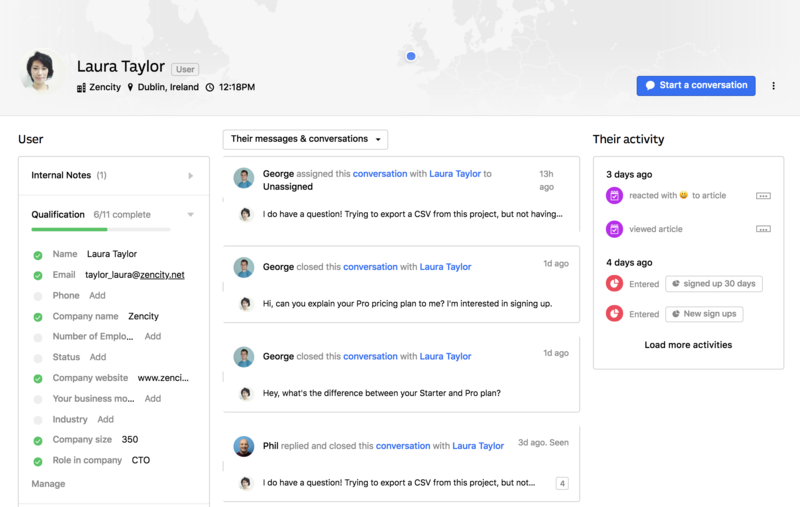 You can send events to Intercom, to record whenever users take specific actions in your product. Events record the first and last time a user does something and the total amount of times they do something. For example, you can see the first time users clicked on a particular page, or when they most recently purchased an item. Are users visiting the same product page a lot recently? Have they downgraded their plan? Ready to get going with events? You can learn how to send events to Intercom, along with metadata about those events here. You can quickly and easily export your user data out of Intercom. Here's how to do that. Note: The second URL above will only work for unique email addresses - these are email addresses that exist once in your user list. 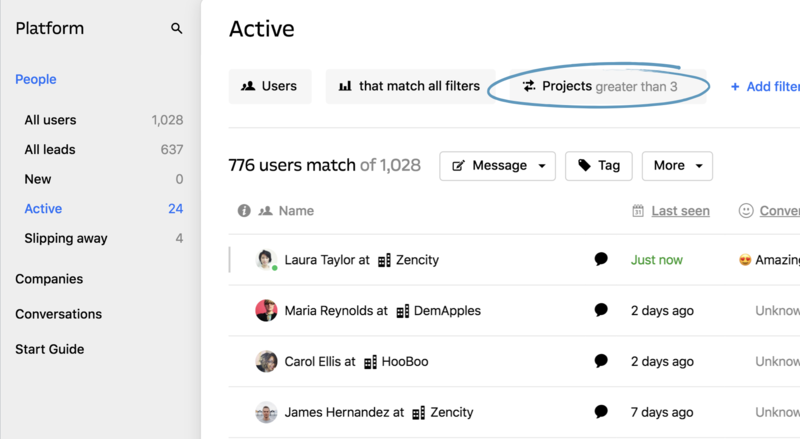 Now that you know how to track user data in Intercom, it’s time to segment important groups of users into specific groups so you can send them targeted auto messages.